Article Writer For Hire - Get Help Writing Online From Home & Managing Your Career! Hire professional content writers or get web writing and social media tips from the experts! Take a look around to learn more about us. Read web writing tips from expert web content writers, Lyn Lomasi, Richard Rowell, and the occasional guest poster. Learn how to write for the web, manage your web writing career, promote your work, and more. 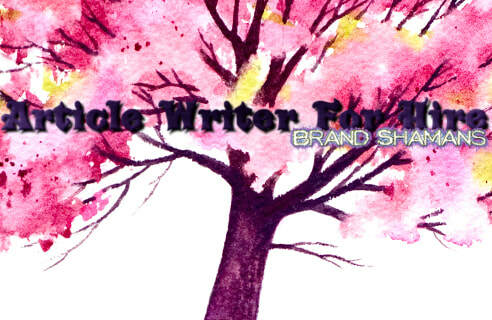 Success and quality for web writers is our specialty. Lyn Lomasi & Richard Rowell are writers and thought leaders helping others to get hired and/or make money online. Learn how to connect with & meet other professionals, as well as network with potential clients and build your own online empire simply by following us in our own journey. Summon the Brand Shamans for custom social media, marketing, brand healing, and content services. We work within your needs and budget to magically heal your brand, based on its needs. Choose our value packages, have us build you a customized package, or purchase services individually. What's New In Our Network?